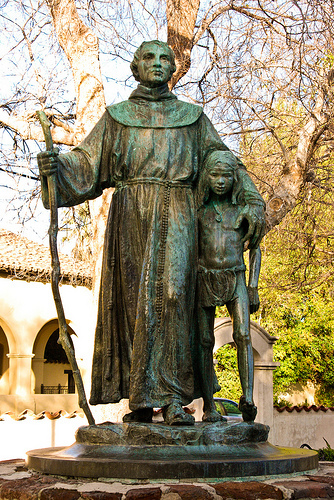 Junipero Serra, the Franciscan Missionary and Apostle of California, is known for his devotion to the Blessed Virgin Mary. He sought "the gold and silver of the Indies - the gold of immortal souls and the silver crown of martyrdom," and left his "Rosary of Missions" along California's El Camino Real, from which has sprung most of what is holy and most of what is cultural in the far western part of the United States. O Lord Jesus Christ, you have rewarded the apostolic zeal of Thy servant Junipero Serra, who, leaving home and fatherland, labored for the salvation of souls in Mexico and California. Thou hast graciously deigned by evident signs and prodigies to glorify him, so that for the exaltation of Thy Most Holy Name he was raised to the honors of the altar. Grant that through his merits I may obtain the grace I desire. Amen.